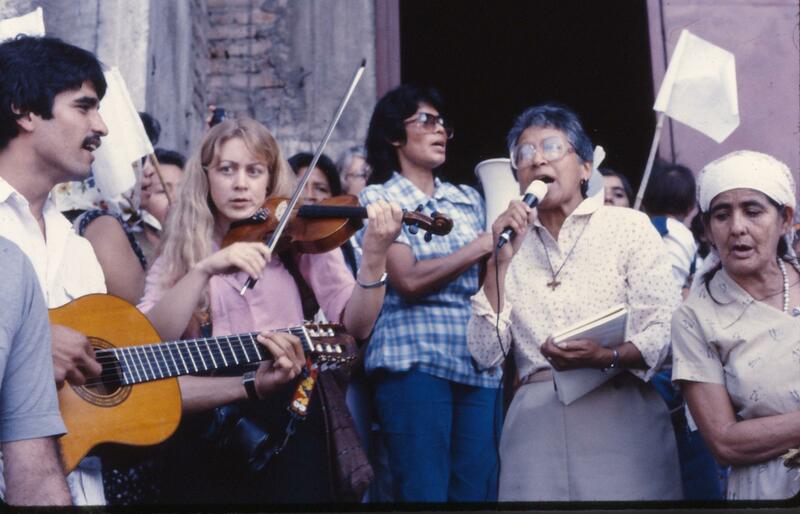 On the anniversary of the 1992 peace accords in El Salvador, I wanted to share this video of Women of El Salvador’s War by Lyn McCracken and Theodora Simon. The film features Esperanza Ortega, one of the interviewees in Birthing God. She is the woman in yellow in the center of the photo below. http://www.cultureunplugged.com/documentary/watch-online/play/52583/Mujeres-de-la-Guerra–Historias-de-El-Salvador. In another incident, Esperanza, her husband, and several others were fleeing an army incursion when her husband was hit by gunfire. “It was another experience with this lived faith, this really deep trust in myself. My husband was shot through the back, through his shoulders.” Using her hands, she shows me how the two G3 bullets exited his body. Her left hand, starkly brown against the canary yellow of her T-shirt, bursts open beneath her left breast, and her right hand splays above her right breast. “Two giant holes, here and here, and the flesh hanging out, and the blood running. And I thought to myself, ‘He’s going to die,’ because just looking at him you could see that. But a health promoter—one of our own, trained in first aid—cleaned the wounds and then covered them so that they wouldn’t get infected. It was a miracle of God! Not a single organ was touched! No infection! And we were there hiding in the mountains, in the brush, for a month! I say this because we need to have faith in our own capacities. Sometimes you think that only the doctor can heal, but no, it’s faith that heals.” The health promoter, she emphasizes, was a campesino—a subsistence farmer like herself—who had faith in his abilities to save her husband’s life.